You have it all under control Faraday. Until Allie gets a hold of this....then watch out! Sounds like the purrfect day to us! My goodness Faraday, don't you need sleep????? That's a very busy schedule. Looks like a good schedule to me! You are so correct!! And furry smug about it all too, MOL! Where is the trip to Aunt Connie's house? 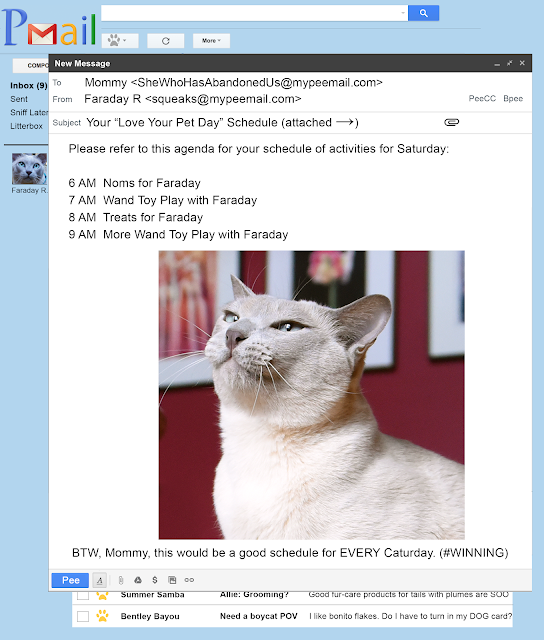 I think kitties should ALWAYS set their humans' schedules - that's the only way they'll get the important things done! That seems quite sensible to us. That should be a schedule for every day, not just for Caturday! Keep that Mommy in line, Faraday. Good work Faraday! I'm sure your Mommy would be lost without an assistant like you around to help her. I think it sounds great for a cat! Hope the schedule goes off for you as planned. Your face says it all Faraday! Sounds like a good schedule. I would never get my mum out at 6am though. I've tried but she pretends to be asleep. My dad gets out though and opens my cat flap so I can go out in the garden. Nothing to worry about pal - everything looks good on the schedule. I think you will be fine. That is a great schedule. That would be a great schedule for every day. Good schedule Faraday... The rest of the day belongs to the others? Puurfect scedule , Faraday ! !